Think if a Reese’s Peanut Butter Cup and a Pancake had a baby you’d get this. 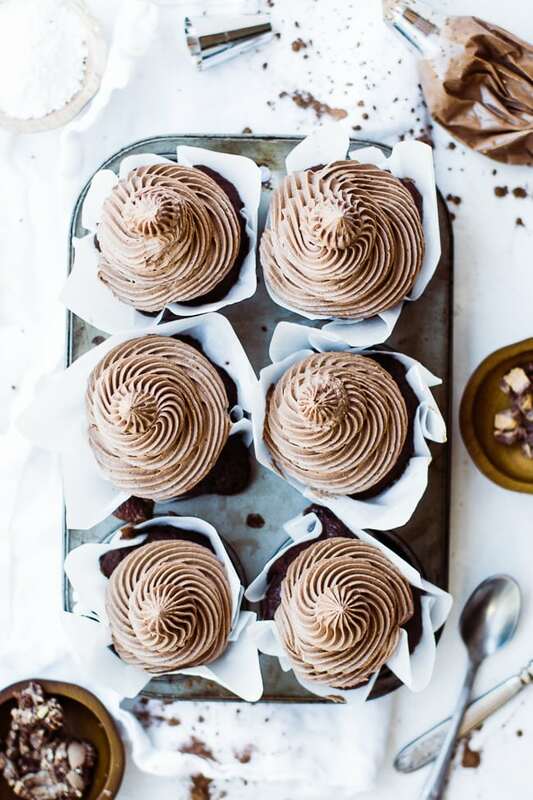 Chocolatey fluffy cake topped with chocolate peanut butter maple frosting. 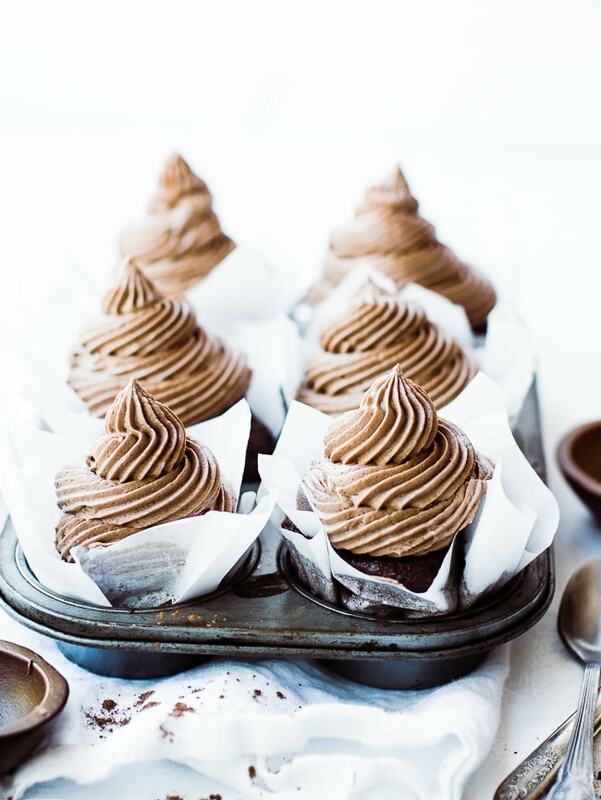 Pretty much the best frosting, or cupcake experience of you life….and I’m not exaggerating. To me, what makes a cake, or a cupcake, is THE FROSTING. I am 100% about having the best possible frosting. Frosting is also fun t mix up! 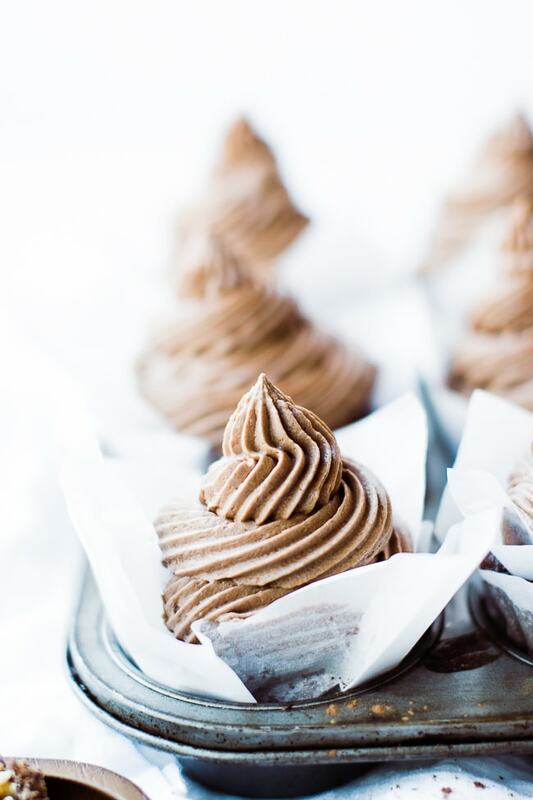 Buttercream is pretty bomb, but its also vanilla- and we all need a little chocolate in our life. and peanut butter. and maple for goodness sakes! ROOM TEMP BUTTER- If it is too cold you’ll have clumps, if it’s too warm your frosting will be on the runny, less fluffy side. ROOM TEMP BUTTER. QUALITY POWDER SUGAR- I have bought generic brand powder sugar that left my frosting gritty, ever since then I can’t bring myself to buy a brand I don’t trust. 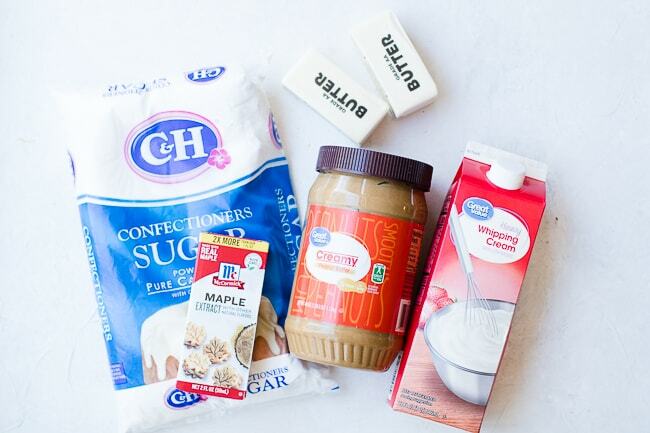 This special sugar also helps make frosting nice and fluffy! STEP 1. Take your room temperature butter and beat it for about 30-60 seconds on med-high speed until it is nice and fluffy. 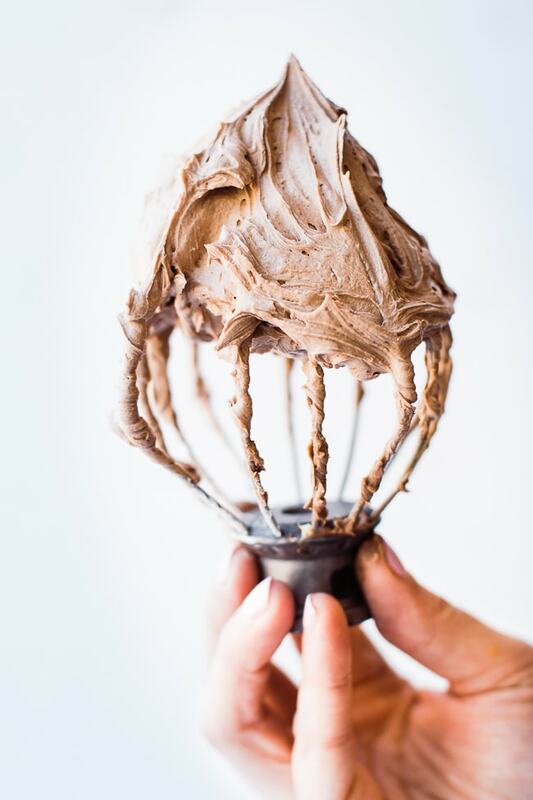 You will need to use a hand mixer or stand mixer to make frosting. Step 2: Turn mixer down to medium speed and add in vanilla maple and salt. Step 3. Add in your peanut butter and beat on med-high for another 30 seconds so they are creamed together and fluffy. Step 4. While beaters are on med speed slowly add cocoa powder, powder sugar and cream. 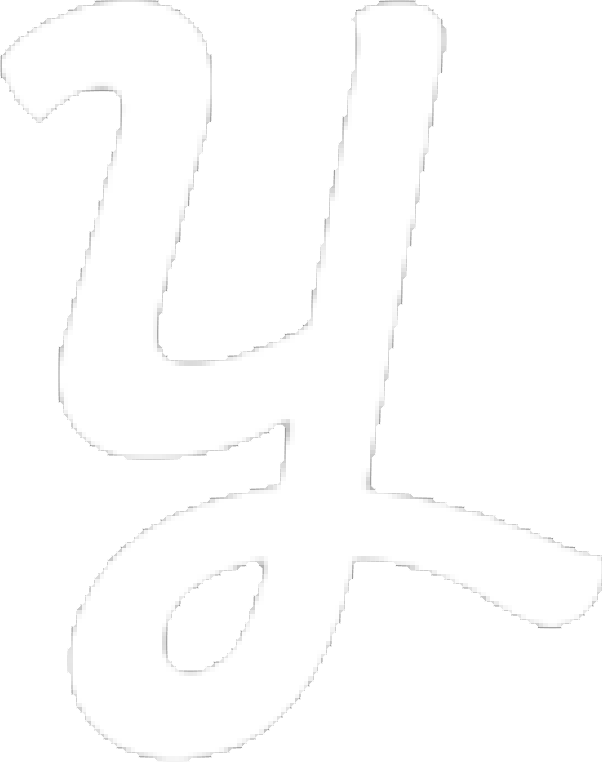 Alternating cream with powder. Step 5. Let beat on high for about 30-60 seconds until the frosting has reached your desired consistency. You want it smooth and fluffy. 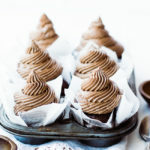 HOW DO I PIPE FROSTING ON CUPCAKES? I don’t always pipe frosting on the cupcakes, but do kind of love it. I also love how fast and easy it makes frosting cupcakes. I take a few short cuts- let me show you how. 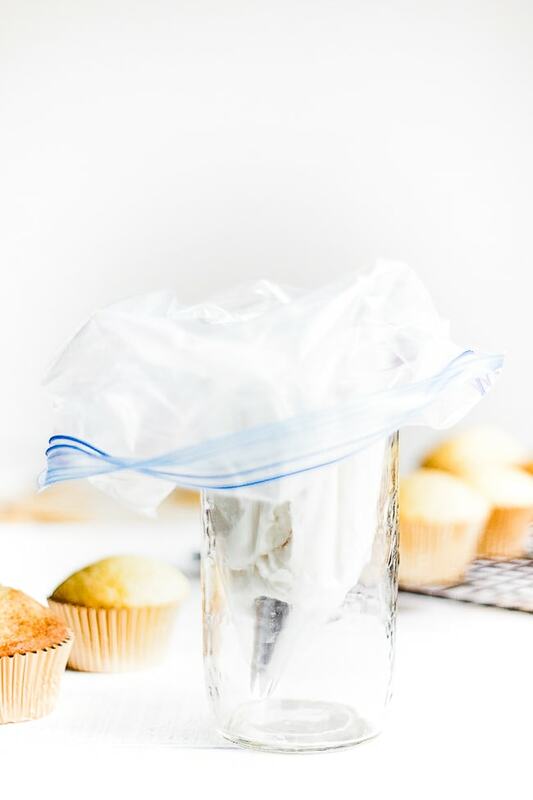 PRO-TIP 2: Use a Cup to load up you frosting bag! I cut a corner out of my ziplock and add the tip. Then fold the sides over a tall cup- as pictured below. and of course, we all know crumbled BACON goes amazing with maple flavor! 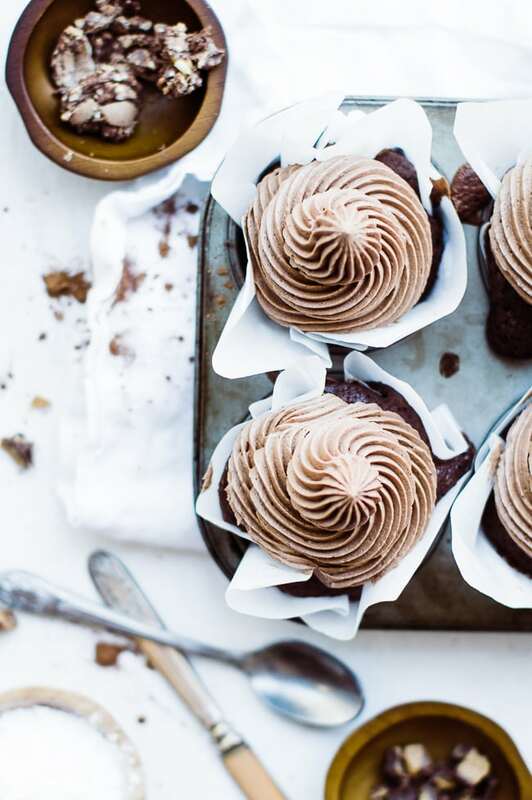 The best, moist and delicious chocolate cupcake recipe that i love is this No-Fail Chocolate Cupcake Recipe. And while you can use any flavor of cake as the base I strongly recommend using chocolate cake/cupcake as the base. I mean, peanut butter and chocolate are totally MFEO. 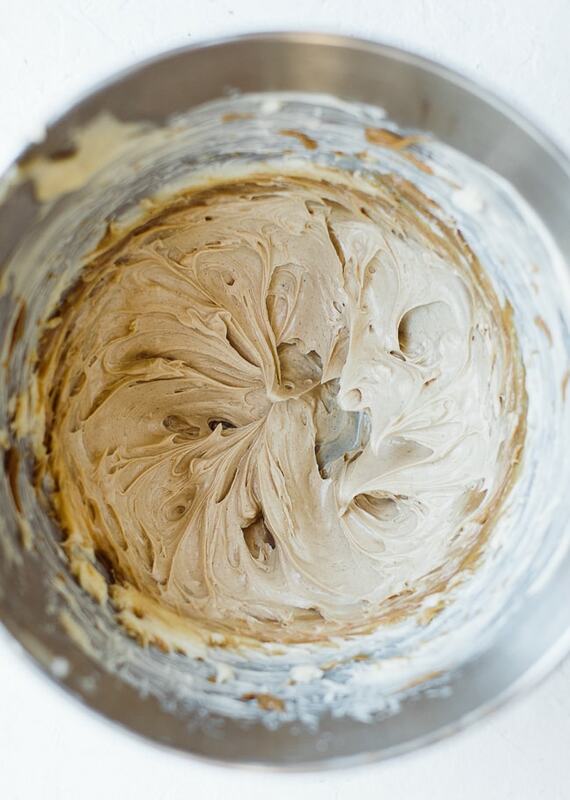 A delicious and easy peanut butter maple frosting that's pretty hard to not eat by the spoonful.  Use this to top cupcakes and cakes. 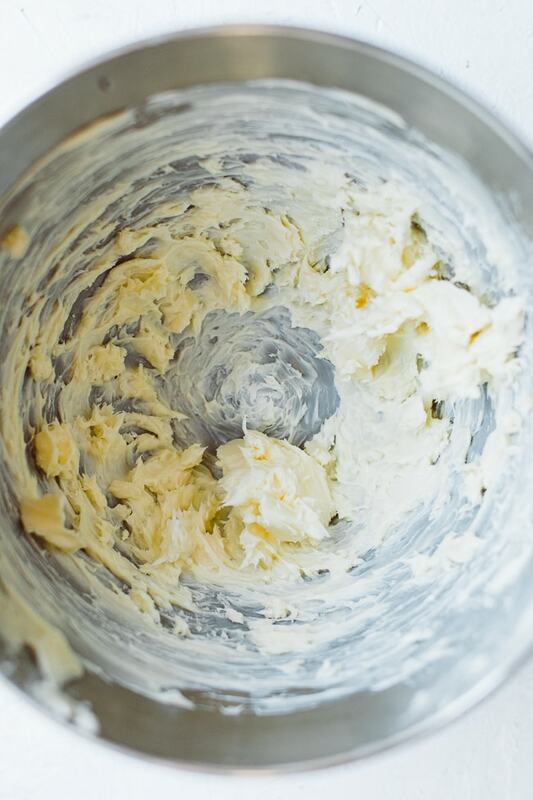 Cream butter in mixer until light and fluffy. Add vanilla and maple extract, salt, and powdered sugar. Add cream, starting with 1/3 c, increase up to 1/2 c to achieve desired consistency. I don't always pipe frosting on the cupcakes, but do kind of love it. I also love how fast and easy it makes frosting cupcakes. I take a few short cuts- let me show you how. 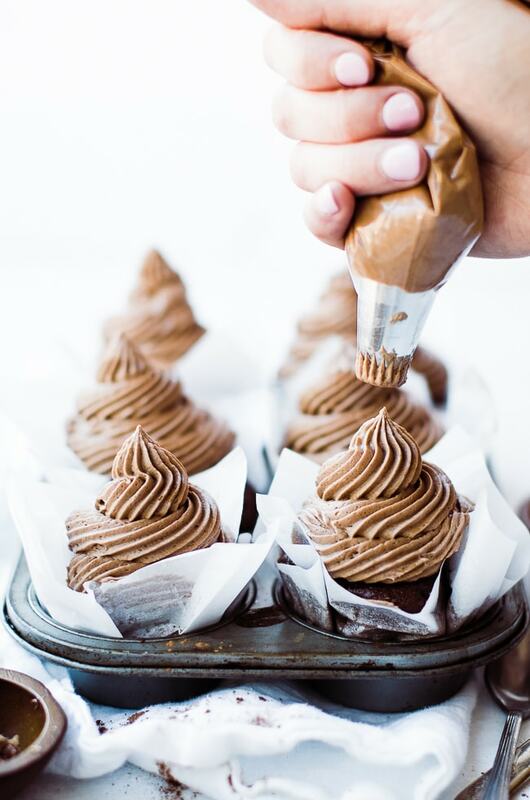 PRO-TIP 3: Using a firm grip, twist the top of the bag (so frosting won't squeeze out the end!) and apply even pressure in circular motions around the edge of the cupcake working inward. Made these tonight for a get together with friends and they were a hit! Everyone LOVED them! 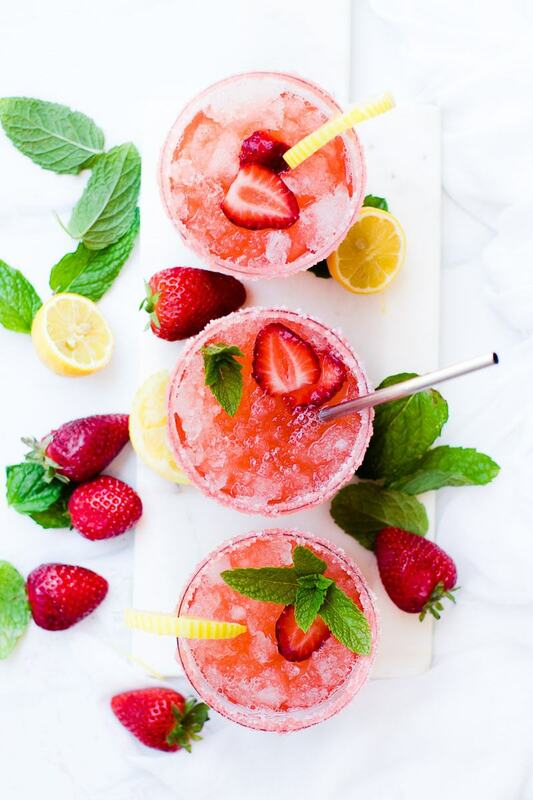 LOOOVE this recipe! it is the perfect combination of chocolate, peanut butter and a touch of maple. Surprisingly it is not a heavy or overly rich frosting and the best smooth texture! Paired these with the chocolate cupcake and recommended and they were gone in a flash. HUGE COMPLIMENT! Thank you Mel!